Lessons learned from combat operations in Iraq and Afghanistan confirm the growing importance of energy, with corresponding increases in consumption. Satisfying the increased demand for fossil fuels in support of contingency operations costs lives, money, and operational effectiveness. Generators are the biggest consumers of fuel on the battlefield. 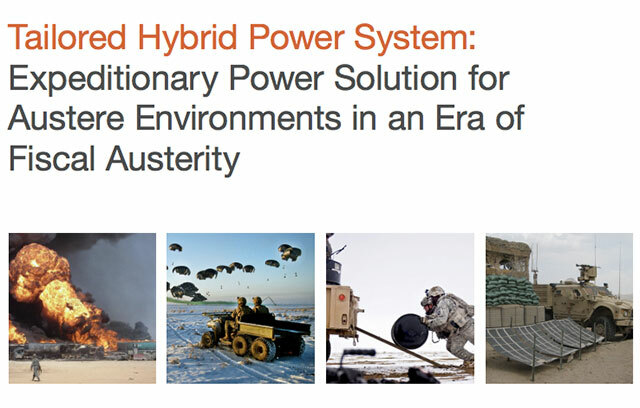 This paper introduces the Tailored Hybrid Power System (THPS). It explains the principles of scalability, modularity, mobility, autonomy, and durability and shows how meeting these five principles can reduce the frequency of fuel resupply operations that expose the Warfighter to avoidable risks and take critical assets away from the fight. *This white paper is not a U.S. government product and reflects solely the opinions of the author.